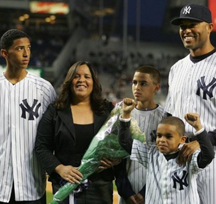 Panama native Mariano Rivera makes history and honors Jackie Robinson. The Baseball Writers' Association of America (BWAA) unanimously elected Mariano Rivera to The Baseball Hall of Fame. The Panama native became the first player ever elected unanimously to the Hall of Fame. Jackie Robison, who became the first African American to play in Major League Baseball in the modern era, was the first Black the BWAA enshrined into the Hall of Fame, and in his first year of eligibility. In 2013, the New York Yankees retired Rivera’s uniform number 42. He was the last major league player to wear the number full-time, following its league-wide retirement in honor of Robinson, who also wore number 42. Now, Rivera, a devout Christian, has distinguished himself at the highest level as well. He told Christian Broadcast News, "The Lord gave me the strength to do all that stuff. So, therefore, I can never speak about myself, but the Lord."